The Independent and Public-Spirited Media Foundation (IPSMF) has provided financial support to CGNet Swara for the purpose of reporting and publishing stories of public interest. The IPSMF does not take any legal or moral responsibility whatsoever for the content published by CGNet Swara on its website cgnetswara.org or on any of its other platforms. CGNet Swara is a voice-based portal, freely accessible via mobile phone, that allows anyon to report and listen to stories of local interest. Reported stories are moderated by journalists and become available for playback online as well as over the phone (+91 8050068000). Many of the estimated 80 million members of India's tribal communities lack access to any mainstream media outlets. This often poses serious barriers to their socio-economic development, as their grievances about government neglect and economic exploitation remain unvoiced. In addition, certain factions (such as the Maoist insurgency) can exploit their frustration and isolation to violent ends. To address this important problem, we have built and deployed CGNet Swara: a voice portal that enables ordinary citizens to report and discuss issues of local interest. To use it, they call a phone number using any mobile (or fixed line) phone. Callers are prompted to press "1" to record a new message, and "2" to listen to messages that have already been recorded. Once a message has been recorded from the field, professional, trained journalists, who access the system using a Web-based interface, review and verify the report. Approved reports are then made available for playback over the phone. The reports also can be accessed on the CGNet Swara website. Interview at the National University of Singapore. Presentation at Microsoft Research, India. An older version of this talk (presented at Stanford University) is also available on video. Short animation describing CGNet Swara. The software underlying CGNet Swara is open-source and freely available from an online repository. The system was originally developed as a project at the Massachusetts Institute of Technology, and is currently maintained with the support of Janastu, Microsoft Research India and several volunteers. While the technology for building interactive voice services (IVR) has been around for a long time, what distinguishes CGNet Swara is the ability for callers to contribute information to the system. Most IVR platforms are designed for callers to listen to messages, but on CGNet Swara, they can also record their own messages for others to hear. Our platform includes a moderator's interface that enables privileged users to review the recordings, and optionally annotate or edit them, prior to making them public. A desktop computer running Linux and Asterisk. An Internet connection (for hosting the Web server). A telephony interface. We recommend the Topex Mobilink IP to enable calls via a cellular SIM card. We are happy to offer guidance to other organizations who are seeking to establish similar services around the world. 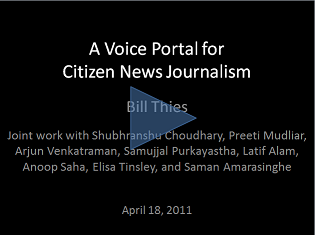 Emergent Practices Around CGNet Swara, A Voice Forum for Citizen Journalism in Rural India. Preeti Mudliar, Jonathan Donner, and William Thies. International Conference on Information and Communication Technologies and Development (ICTD 2012). Atlanta, GA, March, 2012. Presentation slides in PDF or PPT. Cellphones as a Tool for Democracy: The Example of CGNet Swara. Vol. XLVII, No. 15, April 14, 2012. Shubhranshu Choudhary is a Knight International Journalism Fellow and the founder of CGNet Swara. Shubhranshu was a BBC South Asia producer for more than 10 years. He also has served as a media trainer for the BBC World Service Trust, the United Nations and Indian universities. He produced the first television coverage of foreign militants operating in Indian Kashmir and conducted the first television interview with the chief commander of the Kashmiri militant organization. He was a TV and radio producer for the BBC's South Asia bureau for eight years, and a reporter for The Guardian's South Asia bureau for two years. He was a reporter for five years at the Hindi-language Daily Deshbandhu. Bill Thies is a researcher at Microsoft Research India, where he is a member of the Technologies for Emerging Markets Group. His research focuses on creating appropriate information and communication technologies to promote socio-economic development, and he has published over 40 peer-reviewed articles in this and related fields. Bill received all of his degrees from the Massachusetts Institute of Technology, where he finished his Ph.D. in computer science in 2009. His Ph.D. thesis was the recipient of the ACM SIGPLAN Outstanding Doctoral Dissertation Award. Bill designed the initial technology for CGNet Swara and has been associated with the project since its inception. Arjun Venkatraman is a social entrepreneur with a background in architecting bleeding edge tactical IT solutions into enterprise IT projects. He has worked with a diverse range of technologies and users, including the telecom sector in the United Kingdom and virtualization for financial services customers on Wall Street. Having grown up in a family of social activists he has been interested in finding sustainable methods of information exchange, empowerment and participatory democracy. Of particular interest to him is the challenge of connecting communities with language and literacy barriers to the information superhighway. He has been associated with CGNet Swara since 2010 as a volunteer and technical advisor. 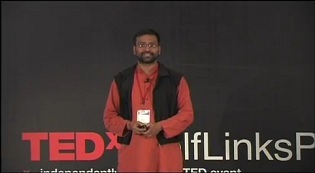 Anoop Saha graduated from Indian Institute of Technology, Kanpur with Computer Science and Engineering as his major. He currently works in the field of electronic design automation. Anoop was born in the remote South Bastar district of Chhattisgarh, India. His parents migrated from Bangladesh to India in 1957. Because of his background, issues such as displacement are close to Anoop's heart. Growing up in a working class family in one of the most isolated and conflict ridden parts of India, Anoop has a deep understanding of the issues faced by the communities of the region. Thus, he merges both the technical and social aspects of the project. Anoop has been associated with CGNet as its co-moderator since 2004. Smita Choudhary is an engineer, entrepreneur and veteran manager with over 20 years of experience with organizations such as LML, Seimens, Crompton Greaves and the BBC World Service Trust. Smita's experience spans several diverse fields, ranging from marketing campaigns in the automobile industry to bootstrapping small businesses. She has worked extensively with non-profit organizations, both at the grassroots level as well as in administration. Her cross functional skill set and hands on approach are an invaluable contribution. Smita has been associated with CGNet since its inception. Elisa Tinsley is the director of the Knight International Journalism Fellowships, a program of the Washington, D.C.-based International Center for Journalists. Elisa is responsible for supervising and implementing this world-wide media assistance program, funded by the John S. and James L. Knight Foundation. She has three decades of professional journalism experience. From 2000 to 2007, she was World Editor at USA Today, where she directed a team of staff reporters and freelance journalists who provided international coverage for America.s largest-circulation newspaper. During her nearly 19 years at the newspaper, she oversaw the expansion of USA Today's international bureaus and coverage of the wars in Afghanistan and Iraq. From 1984 to 1988, she was a Moscow-based correspondent for United Press International, Time, Newsweek and USA Today. She started her journalism career as a business reporter and editor in Chicago and New York. Elisa received her bachelor's degree in English literature from Washington University in St. Louis. She has a master's degree in English literature and language from the University of Chicago. Radhika Shah is a technology entrepreneur and an active mentor in the nonprofit space. In addition to being an advisor to CGNet Swara, she is a cofounder of RajeevCircle - a mentoring group in memory of Stanford Prof Rajeev Motwani, and is on the board of The Friends of The Lurdes Mutola Foundation - a nonprofit that helps educate and empower marginalized girls in rural Mozambique. She has been in executive and leadership roles in the software industry. She founded VirtualSynaptics, a cognitive matching company where as VP Products and Business Development she led the product and engineering teams, and drove business strategy. She was part of the initial teams at GreenBorder (acquired by Google), Oracle.s security products group, and BroadVision. She has also worked at SGI, Sun, Microsystems, IBM Almaden, and Indian Space Research Organization. Radhika holds an MSCS from Stanford and an MBA from Berkeley. She is now also an advisor to the SDG Philanthropy Platform. Benjamin Colmery is the deputy director of Knight International Journalism Fellowships, a program of the Washington, D.C.-based International Center for Journalists. Ben is responsible for assisting in the implementation of the program, with special emphasis on partner development, promotion of the program with international visitors, and monitoring and evaluation. He has worked in Eastern Europe, Sub-Saharan Africa, South America and South Asia to build the capacity of journalists and citizen journalists to inform the public through traditional and new media. He also completed extensive research on the use of economic journalism to foster transparency in the oil, gas and mining industries in Ghana and Nigeria. His journalism development career began with a training program he launched in Ukraine to promote print journalism in several small Ukrainian communities after the 2004 Orange Revolution. He has a master.s degree in international media development and communications from Columbia University.s School of International and Public Affairs, and a bachelor.s degree in English literature from Albion College. Saman Amarasinghe is a professor in the Department of Electrical Engineering and Computer Science at the Massachusetts Institute of Technology and a member of the Computer Science and Artificial Intelligence Laboratory (CSAIL). His research interests are in discovering novel approaches to improve the performance of modern computer systems without unduly increasing the complexity faced by either application developers, compiler writers, or computer architects. Saman received his B.S. in Electrical Engineering and Computer Science from Cornell University in 1988, and his M.S.E.E. and Ph.D. from Stanford University in 1990 and 1997, respectively. We thank Rahul Gonsalves for an excellent redesign of our site! Independent and Public-Spirited Media Foundation is a public charitable trust registered vide a trust deed executed on July 1, 2015, as document No. 99 IV (15-16) dated July 1, 2015, at the office of the Sub-Registrar, Gandhinagar, Bangalore, Karnataka. IPSMF has been registered under Section 12AA (a) of the IT Act, 1961 and its registration number is CIT(E)/BLR/12A/M-134/AABT12413E/ITO(E)-1/ Vol 2015-2016 with effect from 08.01.2016. IPSMF has also been granted approval under section 80G (5) (vi) of the IT Act 1961 with effect from 08.01.2016 (Approval no: CIT(E)/BLR/80G/M-135/AABT12413E/ITO(E)-1/ Vol 2015-2016). Most of our team is based in New Delhi and Bangalore, India. 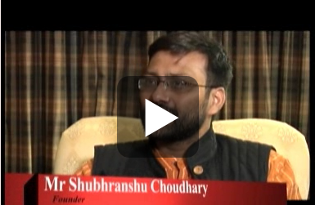 Inquiries can be addressed to Shubhranshu Choudhary at shu@cgnet.in.